Dudok van Heel examined the historical context of the painting closely and made a surprising discovery. AMSTERDAM More than 365 years since the Night Watch was completed, the identity of the men portrayed in the portrait has at last been revealed. Dutch historian Bas Dudok van Heel has unravelled the mystery after years of research in archives and inventories of estates. A precise description can now also be made of the great hall of the civic guard building known as Kloveniersdoelen (todays Doelen Hotel in Amsterdam), the room for which Rembrandt originally painted the Night Watch. These astonishing findings are premiered in the English edition of The Rijksmuseum Bulletin which is presented today at Tefaf in Maastricht. Around 1715, a shield was painted onto the Night Watch containing eighteen names. Only a few of the names were known to belong to particular figures in the portrait. Dudok van Heel set out in pursuit of the men behind the remaining names. He researched their families, their financial position and their business contacts. He even found items of clothing and accessories depicted in the Night Watch mentioned in inventories of estates. He collated this information with the age of the various militiamen in 1642, the year the painting was completed. This enabled him for the first time to link each name to a figure in the painting. Dudok van Heel examined the historical context of the painting closely and made a surprising discovery. It has long been known that the Night Watch was made for the great hall of the civic guard building, the club house as it were of the Harquebusiers: Kloveniersdoelen, todays Doelen Hotel. Built in 1627, it was Amsterdams leading reception hall. Between 1640 and 1645, the civic guard commissioned the citys principal artists to paint portraits of all the companies based at Kloveniersdoelen. Dudok van Heel has established for the first time that the six group portraits by Rembrandt, Pickenoy, Bakker, Van der Helst, Van Sandrart and Flinck were originally displayed in a continuous series of militia portraits in the great hall. Not separate paintings, as had long been thought, but an unbroken frieze of large paintings each matching the other and fixed in the wooden panelling of the room to form a meticulously designed total interior concept. From Dudok van Heels reconstruction of the hall for the Bulletin, it is clear that Rembrandts Night Watch contrasted in both composition and colour with the other portraits. It seems, therefore, that Rembrandt did not adhere to the terms of his commission. 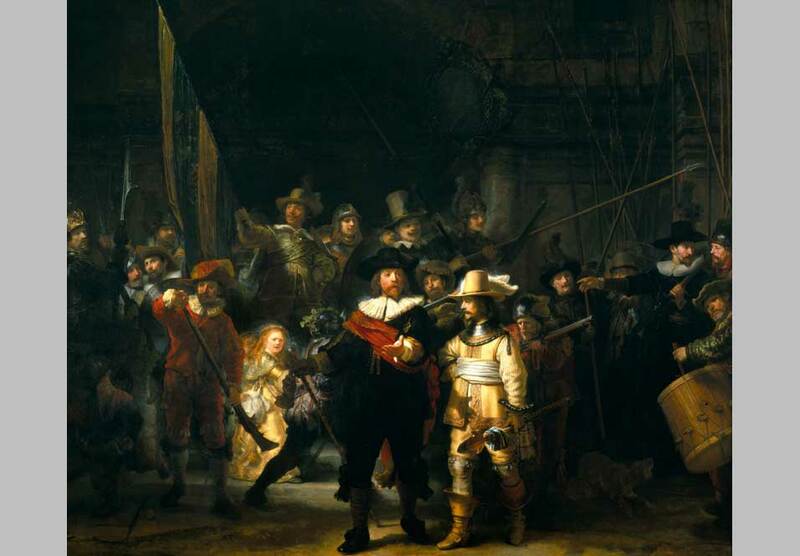 Rembrandts Night Watch is on display 364 days a year from 9 am to 6 pm in the Rijksmuseums Philips Wing.